In the United States, children are often given the opportunity to engage in pretend activities; many believe this kind of play benefits children’s development. Recent research has shown, though, that when children ages 4 to 6 are given a choice to do the pretend or the real version of 9 different activities, they would prefer the real one. The reasons children gave for preferring real activities often concerned their appreciation of the functionality; when children did prefer pretend activities, their reasons often cited being afraid of, not allowed to, or unable to do the real activity. 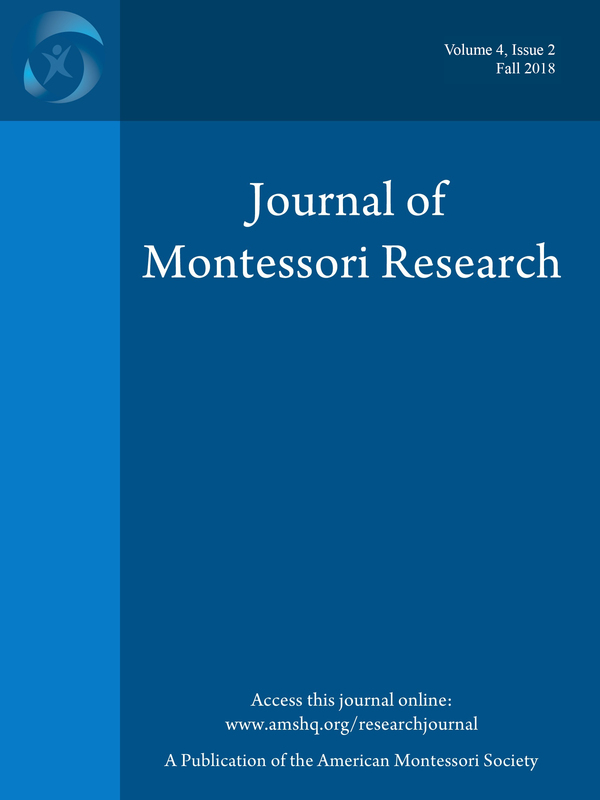 Given that children in Montessori classrooms have more experience performing real, functional activities, in this study we asked if this preference for real activities is even stronger among children in Montessori schools. We also asked children to explain their preferences. The data are from 116 3- to 6-year-old children (M = 59.63 months, SD = 12.08 months; 68 female): 62 not in Montessori schools and 54 in Montessori schools. Children explained their preferences for pretendand real versions of 9 different activities. Children in Montessori schools preferred real activities even more than did children in other preschools, but all children explained their choices in similar ways. The implications of these results are discussed with regard to play in preschool classrooms. Bennett, N., Wood, E., & Rogers, S. (1997). Teaching through play: Teachers’ thinking and classroom practice. Buckingham, UK: Open University Press. Copple, C., & Bredekamp, S. (2009). Developmentally appropriate practice in early childhood programs serving children from birth through age 8. Washington, D.C.: National Association for the Education of Young Children. Haight, W. L., & Miller, P. J. (1993). Pretending at home: Early development in a sociocultural context. Albany, NY: SUNY Press. Haight, W., Masiello, T., Dickson, K., Huckeby, E., & Black, J. (1994). The everyday contexts and social functions of spontaneous mother-child pretend play in the home. Merrill-Palmer Quarterly, 40(4), 509-522. Hirsh-Pasek, K., Golinkoff, R., Berk, L., & Singer, D. (2009). A mandate for playful learning in preschool: Presenting the evidence. New York: Oxford University Press. Lillard, A. S. (2013). Playful learning and Montessori education. American Journal of Play, 5(2), 157-186. Lillard, A. S. (2017). Montessori: The science behind the genius (3rd ed.). New York: Oxford University Press. Montessori, M. (1949). The absorbent mind. Adyar, Madras, India: The Theosophical Publishing House. Montessori, M. (1966). The secret of childhood (M. J. Costello, Trans.). New York: Ballantine. Sandberg, A., & Samuelsson, I. P. (2003). Preschool teachers’ play experiences then and now. Early Childhood Research & Practice, 5(1). Singer, D. G., & Singer, J. L. (1990). The house of make-believe: Children’s play and the developing imagination. Cambridge, MA: Harvard University Press. Singer, D., Singer, J., DiAgostino, H., & DeLong, R. (2009). Children’s pastimes and play in sixteen nations: Is free play declining? American Journal of Play, 1, 283-312.